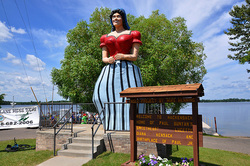 This quaint Minnesota trail town is located on the scenic shores of Birch Lake. There are 127 lakes within a 10-mile radius of the town as well as a state forest and the Chippewa National Forest. Wildlife such as deer, black bear, bald eagles, fishers, porcupines, timber wolves, coyotes, bobcats, loons and more can often be seen in the surrounding forests. Hackensack is located about 50 miles north of Brainerd and 50 miles southeast of Bemidji. The population of Hackensack is under 300, but this is not a sleepy community - rather a bustling, active community. Visitors come year round to see the fall colors, take in the National Chainsaw Carving Competition, ice fish, or just cozy up to a warm fire and to watch the ice go out in the spring, while viewing the leaves bud out and the many spring flowers that bloom in the area.